There be treasure in them there hills! 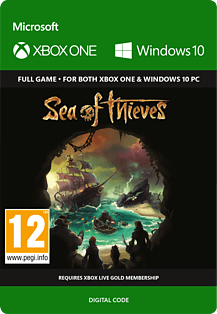 Developed by Rare and published by Microsoft Studios for both Xbox One and Microsoft Windows, Sea of Thieves is the ultimate pirating adventure – think Pirates of the Caribbean but you get to control the galleons and the lead characters. Designed from the ground-up as a cooperative multiplayer adventure, Sea of Thieves is perfect for people who want to play with their friends or people around the world in a high stakes pirate adventure like no other. Played from a first-person perspective, Sea of Thieves features cross-playing abilities between people on a home PC set-up and those playing on the Xbox One. As a group, players will travel and explore an open-world via a typical pirate ship. Each of the gamers in the team will be tasked with taking on a different aspect of sailing, including steering, navigation, weapons management and hoisting sails. The aim of the game? To tackle a variety of missions, collect treasure and engage in allmanner of sea-based combat with other players. The world is entirely shared, which means that players will meet each other regularly throughout the course of their adventure and while the map is large enough to explore at leisure, battles will come thick and fast. When it comes to the graphics in Sea of Thieves, the game presents itself with a cartoon style and an exaggerated physics engine. This physics engine allows players to perform a variety of unusual motions, including that classic circus act: being shot out of a cannon. 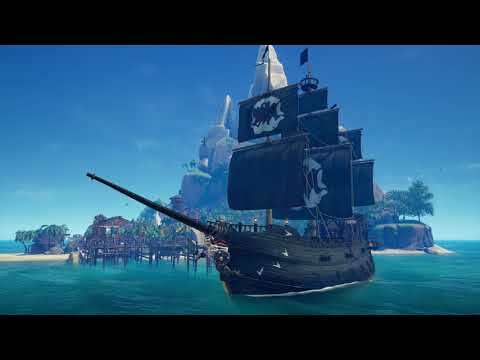 Rare was very keen to offer players the option of forming a crew and carrying out their missions in a peaceful manner. That won’t be for everyone of course, and the option to blast a rival’s galleon into hundreds of tiny pieces will be too good an opportunity to pass up for most. The range of player options in Sea of Thieves is something truly special. Gamers have the choice of four-person galleons, two-person sloops or even single-player boats. They can then take on a series of simple ‘fetch’ missions for numerous trading companies within the game, scattered across the environment. Gamers, get ready to take on the Kraken. The legendary sea monster will be wreaking havoc over the course of the game with its giant tentacles causing serious damage to boats and crew members too. The Kraken is just one example of a public event within Sea of Thieves. Players will spot the monstrous beast and sail in to fight alongside others across the world. This cooperative element with rival crews is something that developers Rare have wanted from the beginning. With shaky alliances to be formed and the promise of lots of loot, Sea of Thieves is a cooperative game like no other, especially when combined with the stunning Microsoft Xbox One and home PC set-up. Now's the time for true pirates to take the Sea of Thieves and hunt down the deadliest catch of all! What bonuses do you get with the Sea of Thieves controller? The Sea of Thieves limited edition controller is specifically designed for easy, wireless navigation with custom button mapping. An excellent bonus of this uniquely designed controller includes a special in-game Ferryman clothing set for your personalised pirate. What are the main elements of gameplay? There are two main elements of gameplay throughout Sea of Thieves. Participate in and unlock various opportunities to build a reputation with multiple trading companies. Gain rewards and rise amongst the ranks as you successfully vanquish more voyages. Whilst on the quest for your treasures, approach and attack rival players whilst navigating on rough seas. How does the Sea of Thieves multiplayer mode work? Rare and Microsoft have brought to you a fantastic multiplayer system for Sea of Thieves. Travel amongst shared worlds whilst playing with fellow pirates in a team. Each player assumes their own role within the ship and must work together as a team to navigate and attack enemy ships. Ship customisation and a large variety of pirate costumes and accessories are just two of many Sea of Thieves features. Weather elements alter the gameplay and there are various voyages and quests that are available to conquer. Ship navigation features such as steering, raising/lowering sails, firing cannons, anchor lowering and plugging leaks make multiplayer gameplay all about teamwork! What characters can I expect to see in Sea of Thieves? Find yourself with an abundance of characters to choose from, as Sea of Thieves possesses a near-limitless supply of possible pirate creations. Define your characters throughout the game as you unlock outfits and gears and enhance your personal objectives by conquering voyages. "Xbox Live Gold required to play (sold separately)."